You see her in the distance running toward you on the beach. It's really her - Divided Government. You've missed her. She looks so great, so tempting, so desirable, but she is so far away. She appears to be getting closer, but... Why is she running in slow motion? Is she real or is it all a dream? 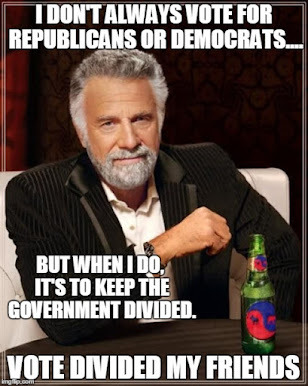 Divided Government occurs in the US federal government when the party that controls the executive does not command majorities in both branches of the legislature. To restore divided government in the mid-terms, Republicans would have to retake the majority in either the House of Representatives or the Senate. That means a shift of 40 seats in the House, or 10 seats in the Senate or both. A tall order. Yet, in the wake of the Scott Brown election to the Senate, the punditocracy are beginning to speculate on how divided government would affect the Obama administration. 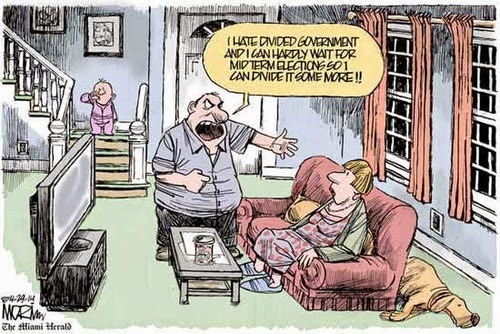 "Under a divided government, party purists on both sides have less leverage to block compromise. This may help to explain the counterintuitive finding by Yale political scientist David Mayhew, who determined in his study "Divided We Govern" that unified governments were no more likely to produce substantial legislation than divided ones. Few would regard the government shutdown of 1995 as the good old days in American government. But in retrospect, Bill Clinton may not have been able to triangulate himself to victory in '96 if he couldn't campaign against the Republican Congress -- and he may not have been able to return the federal budget to balance without Republicans to cut the deal in '97." Interesting that she invokes Mayhew. During the campaign, DWSUWF wondered how the Mayhew concept of a "pervasive public appetite for change" might impact major policy initiatives like healthcare reform and energy policy under one party rule. More interesting than speculation on how divided government would affect the administration, is the question of whether and when it could happen. Is there a plausible scenario where divided government might be restored in the 2010 midterms? When DWSUWF looked at this question after the election, and again last year, we concluded - "No". There was no reasonable probability of restoring divided government in 2010. The GOP were in too deep a hole to get out in once cycle. But then... there was no reasonable probability of Scott Brown winning the Massachusetts Senate seat previously held by Ted Kennedy. This is the real message of Scott Brown's win. What was improbable, becomes possible. Instead of asking "What will happen?" - the question for Republicans and Independents becomes "How do we make this happen?" How can divided government be restored in the 2010 midterms? Most think the best chance is the House of Representatives, since all representatives run for re-election every year. History says otherwise. Gerrymandering, the crushing re-election rate for incumbents, and voter affection for their own representative while loathing Congress as a whole, all conspire to make the 40 seat House differential virtually insurmountable. The best chance is the Senate, and it is not much of a chance. With Scott Brown in the Senate, the Republicans still need 10 in 10. Ten more seats in 2010. "I suspect a Republican gain of five to seven seats, predicated on Democrats being unlikely to capture any more than one, at most, Toss up GOP Senate seats (the open seats of Sens. Jim Bunning in Kentucky, Kit Bond in Missouri, Judd Gregg in New Hampshire and George Voinovich in Ohio) and not being able to hold onto more than one, at most, of the five Democratic Toss ups (Sens. Blanche Lincoln in Arkansas, Michael Bennet in Colorado, Arlen Specter in Pennsylvania, Harry Reid in Nevada and the open seat of Roland Burris in Illinois). The open Democratic seats in Delaware and North Dakota are goners." "Right now, the program is showing that Democrats will retain an average of 54.7 seats in the 112th Congress... And things could, potentially, get a whole lot worse than that; the program recognizes that the outcome of the different races are correlated based on changes in the national environment. Between the surprise in Massachusetts, and races like California and Indiana which are potentially coming into play, there's about a 6-7 percent chance that Republicans could actually take control of the Senate, and another 6 percent chance or so that they could wind up with a 50-50 split." "Democrats might lose the seats formerly occupied by Biden (DE), Obama (IL), Reid (NV), and they've lost the Kennedy seat. Beyond these nifty talking points, though, there's not much of a case to me made just yet that Republicans can win eight seats." "There are three midterm elections in the last sixty years in which the party not in control of the White House picked up 8+ Senate seats: 1958 (16), 1986 (8) and 1994 (8). Two of these are sixth-year midterm results, and so are not necessarily comparable to the middle of Obama’s first term. I have covered why this year is not like 1994 for the House, but even if the Senate elections somehow produced the same result as in ‘94 the GOP could not regain control of the Senate. To argue that the GOP can win a Senate majority, one would have to argue that the ‘10 midterms are going to be even worse for the presidential party than 1994 was." It's unanimous. The GOP will pick up 4-6 seats, but a majority in the Senate will wait until 2012. 9 of 11 will split the the Senate evenly at 50-50. That leaves Joe Biden as the tie-breaker and we remain under One Party Democratic Rule. Until and unless... Joe Lieberman decides to end his destructive, co-dependent and abusive relationship with the Democratic Party. Can't you just see it? Joe at the nexus of power, deciding to leave his mark in history as the ultimate Independent, caucusing with the Republicans, giving them the majority in the Senate, and forcing bi-partisanship. Joe just might see it that way. Ten in Ten. Call it the Scott Brown Effect. You know you want it. UPDATED 31-August-10: 2010 Senate Race prediction updated in a new post - Ten in Ten.